Transport for London has released the costs for buying the New Bus for London fleet, and despite years of soothing reassurances from the Mayor that they'll cost less than normal hybrids, they'll actually cost a bit more. If you look at the current cost of a bus, £250,000, roughly speaking, buys you a new bendy bus. We think that we can get a wonderful new bus for London which will be considerably cleaner, greener, lighter and exactly what this city needs for much less than that. The deal that we are able to do with Wrightbus will actually be considerably cheaper and better value for Londoners, because instead of paying under some private finance initiative scheme for the rental cost of the fleet (which is basically what happens at the moment) we will be able to own the buses direct. And these figures don't include the salaries of the second operator (not a conductor) needed when the bus's back door is open, estimated to be around £62,000 per bus per year. We will ensure these buses more than earn their keep over the next few years. By keeping them in harness in the Capital for the entirety of their useful life, we will be extracting every last drop of value out of them. Aside from its Hollywood blockbuster good looks, this bus offers an unparalleled passenger experience and is helping to improve the Capital's air quality. The New Bus for London is an expensive vanity project which the next Mayor will abandon as an outdated and polluting waste of money. 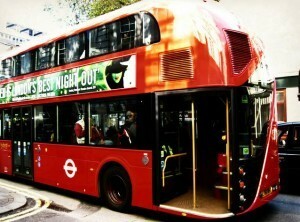 The reason why these buses will spend their entire life in London is because no one else wants them. That is also the reason why TfL have had to buy the buses themselves, at a premium rate, rather than let the operators have all the upfront costs and risks.